Fruit is globe and has yellowish spots on greenish skin. Fruit weighs about 10kg and has orange yellowish flesh. 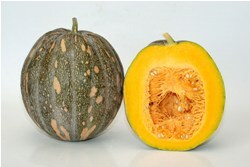 It can be harvested around 110 days after sowing. Suitable for fresh market and processing use.